The marijuana midterms are over and legalization efforts went three-for-three, including Oregon (as of press time with 91.9% of votes counted) breaking Washington’s previous record for legalization support. Measure 91 in Oregon came in with 55.74% of the vote vs. 2012’s Washington I-502 posting 55.70%, and Colorado’s Amendment 64 passing with 55.32%. This is significant, as experts predicted lower support during the traditionally more conservative, older-skewing midterm elections. Furthermore, Oregon set this record without the compromises of per se DUID levels and no home grow that helped Washington pass and the absurdly high tax rates both Colorado and Washington used to sell legalization to reluctant voters. Alaska came in with 52.15% as well; like Oregon, including a tax and regulate scheme with low per-ounce taxation rather than sales and excise taxes and omitting any per se DUID limit. Washington D.C. knocked it out of the park with 69.45%, but that initiative doesn’t include a marijuana retail system, only home grow and possession. So when do you book your sativa sightseeing tour of Seaside, Oregon, or your daylight dabbing in Denali, Alaska, or White Widow walkabout in Washington, D.C.? Not quite yet. It’s been voted to be legal, but you still have some time to wait before it is actually legal. In Oregon, the law goes into effect 30 days from the vote, or December 4. But, confusingly, that doesn’t mean you’re legal to smoke and grow pot yet. That’s just the date that the state can begin working to create the rules for the legal marijuana marketplace. On July 1, 2015, is when the personal possession of an ounce in public, eight ounces and four plants at home, a pound of medicated edibles, a six-pack (72 ounces) of medicated liquids becomes legal. While an ounce of hash oil is also made legal, that’s only if it purchased from a licensed retail outlet. Those retail outlets, as well as producers, processors, and wholesalers, can’t even begin submitting their applications to the state until January 4, 2016. It will not be until Spring 2016, after first harvest, or later if applications are delayed, before you can buy legal weed in Oregon. In Alaska, their legalization goes into effect ninety days after the election is certified, which should be sometime near the end of February 2015. At that time, personal possession of an ounce of marijuana in public and six plants at home (only three mature) will be legal, as well as possession of all the results of one’s harvests (note the plurals) in the home. However, 1975’s Ravin Alaska Supreme Court decision already grants the privacy right to having up to a quarter-pound and 25 plants in the home, so this victory doesn’t change much for Alaskans in that regard. But by nine months after the effective date, anticipated to be in mid-September 2015, the state must have the rules in place for licensing marijuana establishments. Again, it will take harvest time and any unforeseen licensing delays before it’s legal to buy weed in Alaska, probably around the end of 2015 or beginning of 2016. Washington D.C. is harder to predict, because all laws passed there are subject to the approval of Congress, which has 30 days to review the initiative. But there aren’t 30 congressional working days between now and the beginning of the next Congress, so it will not be submitted for review until mid-January 2015. That means by late February or early-March 2015, assuming Congress doesn’t move to block the law, possessing up to two ounces of marijuana and cultivating up to six plants at home (only three mature) will be legal. However, sales will remain illegal until the D.C. City Council moves to create a tax and regulate plan for the District, which is already forecasted to happen. That, too, will be subject to review by Congress, so we probably won’t see D.C. pot shops until 2016, at earliest. Remember one important thing: none of these places – or Colorado and Washington, for that matter – have legalized public consumption of marijuana. Now that we’ve legalized, we need to set a good example so the states where passing legalization will be tougher can’t use our civil disobedience against public consumption bans against their activists. 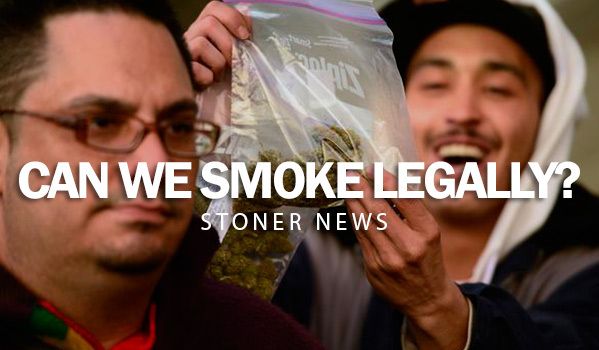 This entry was posted in Stoner Blog, Stoner News and tagged elections, marijuana, stoner.